Our review of Elite Keylogger monitoring software. Learn about all of the features Elite Keylogger offers and compare Elite Keylogger to other similar programs. Elite Keylogger monitoring software provides programs and great tracking features to monitor computer and internet use in your home. Yet, it drops short in its power to block internet sites and applications. This PC keylogging software provides a simple, easy-to-use interface. You are able to install the program in visible or invisible mode. The visible mode has a desktop shortcut and a login alert that notifies users that their activities are being monitored and recorded. The invisible mode hides the application's existence from everyone who uses the monitored computer. In this mode, the application performs its functions in full stealth. Elite Keylogger should be compared mainly as a keylogging application only. We at MonitoringSpySoftware find that this monitoring software product misses the mark on several features we feel should be included as a standard. Record websites visited by all users. Monitor emails sent and received. Instant messenger and chat sniffer. Remains invisible to antivirus software. Recompiles daily with new signatures. Logs delivered to your email address. Collect remote logs via FTP or network. 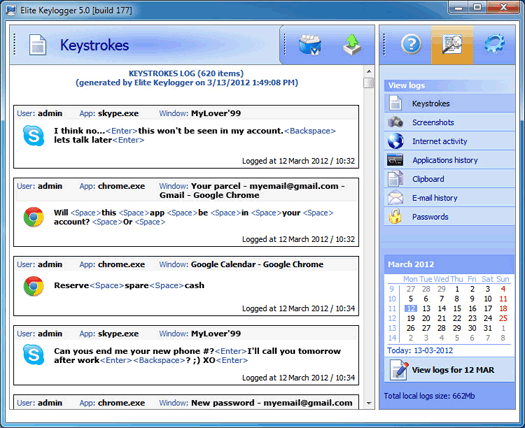 Application Activity - Elite Keystroke Recorder regularly takes screenshots of the Desktop and applications running. Application Launch History - Records all applications launched and the text anyone typed there. You will know the exact time, date, path, window caption and other parameters of the programs launched on your PC. Printed Documents - Records all documents being printed from the monitored computer. Websites Visited - Records all visited Internet URLs and adds timestamps to every entry in the record log. No matter which Internet browser is used, Elite Keylogger monitors every website accessed from your computer. Elite Keylogger also will capture emails sent and received under insecure connections. They also claim to have the ability to see instant messenger communications, however, this is viewed under the keystroke log and is one sided communications only. If you need the ability to see chat communications from both sides, check out our SpyAgent review. So what monitoring features are missing in Elite Keylogger? Based on our checklist criteria, we were unable to find a method to capture emails sent or received other than the ability to see what was typed in an email via the keystrokes log. This package is also missing the ability to monitor website activities, record web mails, monitor Internet connections, see files downloaded or uploaded, view online searches done on Google or Bing, see accessed files, view Window activities, monitor clipboard usage, or see activity such as system shutdowns. This is quite a list of features missing which is why it ranks lower than the other products we've listed on MonitoringSpySoftware.com. Need a side by side comparison? Check out the monitoring software comparison done by TopFiveAwards to make sure the features you need are included! Unfortunately, we have nothing positive to report in the content filtering review. A massive negative for Elite Keylogger is the fact that they offer no content filtering features. Many comparable applications offer these features in one form or another. Also disappointing is the absence of a keyword alert and the ability to block content by keyword. For some users, the omission of these critical elements may render the software ineffective for full-scale computer monitoring product. For these features and more, we recommend SpyAgent. See our SpyAgent review for more information. 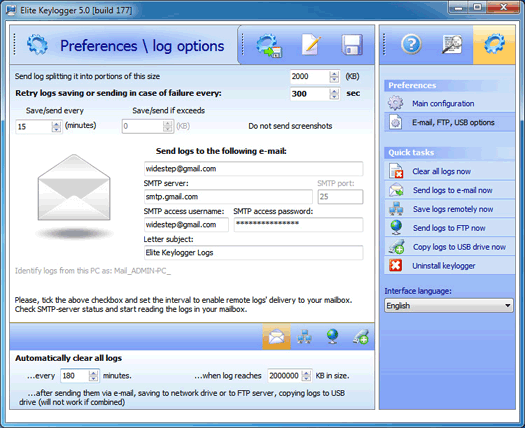 Log Delivery by Email - Just enter the email address you would like to get remote logs sent to, and Elite Keylogger will configure the rest of email settings for you. Log Delivery by FTP or Network - Elite Keystroke Recorder will secretly send logs from the monitored PC to any FTP server you configure. It's simple and has no limit on the log size that can be sent online. Talk to your hosting provider to find out which FTP settings should be used. Log Delivery via a USB Drive - Whenever you insert a prepared USB drive in the monitored PC, all new logs will be secretly copied there, so you can read them later with the convenient Elite Keylogger Logs Viewer. The one thing we worry about with the USB drive function is if you have that option enabled and the monitored user inserts a USB drive to copy a Word document or something else school related, will that drive have all of the logs copied to it as well? That is something to think about. Based on our checklist of features we are looking for in spy software, Elite Keylogger is missing the capability to generate top 10 lists from log data and the ability to search through log data. Elite Keylogger is built with the ability to hide its own modules from antivirus, anti-rootkit and anti-spyware software products. Elite Keylogger ensures it's not detected during regular scans and even after you update your anti-virus software. It implements a number of unique algorithms to stay hidden. This product does a good job staying hidden to other users of the monitored computer. They won't find Elite Keylogger among running processes, in the list of installed applications, in the history of used programs, in the Start Menu, or anywhere else! Widestep, the author of Elite Keylogger, says they recompile Elite Keylogger every day to randomize all its internal file signatures. Additionally, being a registered user, you get access to special builds for clients only. This Elite Keylogger download is not accessible to public, thus it cannot be downloaded and studied by anti-virus vendors. So what security features are missing in Elite Keylogger? There's actually quite a lot of features missing including encrypted logs, the ability to set security preferences, a method to prevent the removal of the software, logging scheduling, lock down scheduling, splash screen alerting system, potable drive monitoring, and stealth hot keys to activate the software settings. Based on the above Elite Keylogger review, you can see that this software package is an excellent solution for those that just need to see keystrokes made on a keyboard along with a few extra options thrown in. From our review of this product, we've discovered that many core features are missing that would make this a complete monitoring spy software. For the current price of $69.00, there are other options that provide more features for around the same price. However, if you need a clean product that isn't bloated with thousands of features that may lag down your computer, Elite Keylogger may be that perfect solution for you. This is primarily why we decided to add this product to the MonitoringSpySoftware.com catalog.